We are Yorkshire’s premier bespoke wooden hot tub surround designers and installation experts. 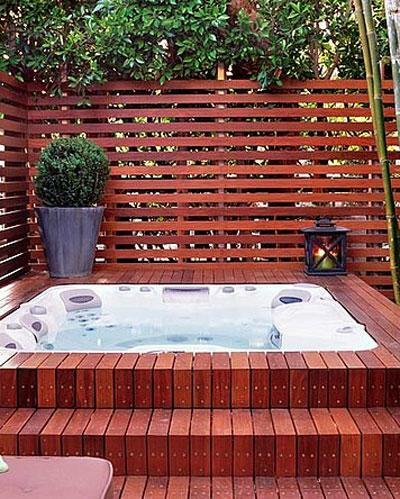 Increasingly customers are choosing to blend their existing Hot Tubs into the overall garden landscape. The image in this case study details how a modern hot tub can seamlessly and beautifully be integrated into a wooden design creating a new stunning garden feature. Our clients briefed us to develop a small and already secluded corner of their garden to incorporate a hot tub and to mirror the already contemporary feel of the house and surrounding grounds. We designed and built a hardwood decking surround including matching contemporary slatted screen. Maintenance access points were made discreetly available in the decking where necessary, without detracting from the slick ultra modern finish. The project was completed on time and budget with zero onsite incidents.